The value of information is dropping. Known answers are easily accessible and search engines, like Google and YouTube, provide knowledge and information in seconds. To cut through the >1 billion webpages and >1.2 trillion searches per year we need a question. I found my way to this book from my Amazon.com’s Recommendations for You list. As an Appreciative Inquiry practitioner I know that every question presents a direction. The challenge is to craft a question that invites participation into what could be. Seems the concern is more about the answer and we have lost the patience for questions. within the business sector, I found few companies that actually encouraged questioning in any substantive way….many companies— whether consciously or not— have established cultures that tend to discourage inquiry in the form of someone’s asking, for example, Why are we doing this particular thing in this particular way? Driven by fear to have an answer, any answer, causes people to preempt the other’s belief that we do not know. questions challenge authority and disrupt established structures, processes, and systems, forcing people to have to at least think about doing something differently. To encourage or even allow questioning is to cede power —not something that is done lightly in hierarchical companies or in government organizations, or even in classrooms, where a teacher must be willing to give up control to allow for more questioning. A view of the future starts with a current question. Innovation can not exist without questions. 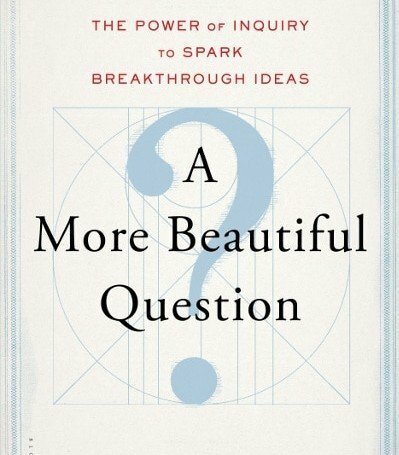 From the board room to a bored room, there is much to gain from A More Beautiful Question. The ability to ask the right question seems to find challenge most notably by the ability for a safe environment for questions. This is my constant challenge. I deeply value your research and effort to understand those who foster both a beautiful question as well as a safe environment for questions. I blog to socialize what I think I may know or to help me better understand what other views have to share. Thank you for your time to take a look at my post, for your comment, and for looking at the Appreciative Inquiry (AI) posts on the site. As AI highlights: Questions are fateful. From the start of your journey to craft this book what shift or discovery in yourself most impresses you? Aside from costs, isn’t this (the suppression of questioning and “push-back”) also one of the key reasons why many enterprises outsource their resources? When you outsource, you eliminate people who naturally push back with questions and you replace them with people who will (according to contract) do exactly what you tell them to do, even if they think it doesn’t make sense to do so, as their only goal is to profit from the established relationship and meet the letter of the contract. In essence, doing so squelches innovation, as the contracted party will only do what they’re told to do, within the boundaries of such contracts. Know what I love about this comment? I never deconstructed the symptom to the disease. Yes, I knew that out-sourcing was cheaper than on-boarding or a full-time equivalent (FTE), but heck no I did not, humbly, deconstruct to execution over instigation. Ultimately, your point, that I add to my view, is not only a bottom-line issue, but really a top-line opportunity. Now, I need to think about the impact that has. How, with this understanding, do you manage the point you brought to the needs at hand? For this reason, I believe there is significant opportunity to identify the caveats and risks associated with outsouring the wrong things, in the wrong ways, and/or for the wrong reasons. People who perform a lot of IT outsourcing wear these scars from their personal experiences, over the last 10 to 15 years. However, most of what they know has not been commoditized and made public as common knowledge, for common consumption. I believe the opportunities lie in developing and broadly socializing this knowledge base. Commodity is the key. When something becomes a commodity there can be a race to the bottom – too often that is realized in wages or margins. So many times you get what you pay for. The more beautiful question gets to, what, exactly, are you paying for? Thank you for contributing to expand the thoughts. How do we break that cycle or does it cure itself overtime by decline and rigor mortis? This is not to imply that all outsourcing is wrong or ineffective. It can be made to work, in the right cases, as no single enterprise (no matter how big it is) can effectively do ‘everything.’ Instead, it’s simply important to note that too much outsouring or the wrong types of outsourcing, in the wrong areas of an enterprise, can lead to the suppression of curiosity, creativity, and ultimately innovation. A strong example of this is when enterprises outsource the majority of their software development. Having local developers means that the developers will often use technology to perform creative work which they are not asked to do (proactively and/or reactively exercising their curiosity and creativity to solve internal problems or challenges for the good of the enterprise). However, an outsourced development team will almost always do the bare minimum work, in order to maximize margins on the contract they’ve negotiated with you. Their questioning curiosity only goes as far as what they can do, as quickly as possible, to meet the criteria of the contract and move on to the next one. Thank you Frank, yes, years at IBM and Perot Systems taught me about the “bare minimum” – it’s a capture strategy that can be very hard to unwind. In terms of software development teams, it has always surprised me that people would willingly choose to overtly pass along strategic IP and knowledge outside the firm with little regard for the long term impact on innovation or competitive advantage. Key question, in my mind is: how to thoughtfully separate and manage your innovation assets and efforts to keep inside what needs to stay inside? Thoughts? Very insightful observation from Toby that outsourcing of resources has occurred because it has become a commodity. Recognition that a key to success is formulating the right question, at the right time for the right audience would mean that resources raising these questions could not be outsourced. As an OD practitioner I have spent countless hours with my peers coming up with what Warren Berger calls a “Beautiful Question.” However, not many folks will read the manual. 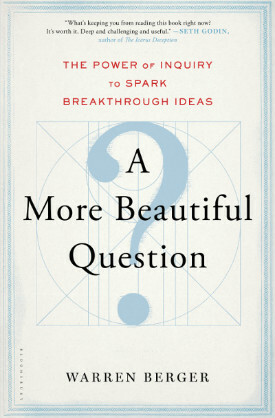 How can we help the average “Joe” or “Josephine” come up with “Beautiful Questions” in real-time? Rapid decision in a rapid response challenges time available for questions to hatch and time for thoughtful response. While I think Frank has a strong point to tie outsourcing with the removal of questions, also, the race for the right answer, now, also seems in battle with the ability to question a more beautiful way. A safe place to learn timely question seems to compliment authority challenged to authentic development of how to question. An easy answer may work for a simple issue, this, however, is not such an easy issue, so I find the search for an easy answer to ‘Joe’ or ‘Josephine’ unrealistic. The solution comes from organization leadership? organization culture? management philosophy? society?